Latest jobs in Recruitment Marketing, Employer Branding, Talent Branding, Talent Attraction, Social Recruiting and Candidate Experience from leading employers. Find your next career opportunity here on the #RallyRMJobs Board to lead the future of talent acquisition. At Publicis Sapient our ambition is to drive reputation as a workplace where great people thrive in the brave pursuit of next. Building a premier talent brand requires thoughtful storytelling and a smart marketing approach to amplify our voice. We’re looking for an excellent communicator to articulate our global talent brand story through all forms of content – from video to blog posts. You’ll work with our regional recruitment and cross-functional teams to ideate and generate content that drives consideration and demand from all our talent audiences. This role will also require strategic big-picture thinking but also a keen eye for detail and knowledge of current and future marketing/social trends. The Director of Global Talent Acquisition will lead the overall TA function for Tiffany & Co., including strategy, execution, operations and employment branding and marketing globally. You'll partner with Global Marketing and Internal Communications to develop, enhance and execute the employment marketing and branding initiatives including social and career site, and ensure the internal and external candidate experience are aligned. You'll develop, execute and measure recruitment marketing strategy to deliver employment brand, attract leading candidates, and effectively develop relationships with potential candidates. Champion careers at Nestlé USA to attract top talent by driving brand awareness through creative recruitment marketing campaigns. As a member of the Recruiting Team, partner with business leaders and internal stakeholders to use talent market insights to drive targeted and impactful communication campaigns. You will spend your time as our Employer Brand champion by extending employer brand to appeal to targeted talent segments by crafting sub-messaging platforms specific to each audience, such as by function, location, critical role, campus, military, diversity for the recruiting organization (Think Career Site, Job intro’s and job advertisements), developing relationships with key internal partners to influence employer brand decisions and become a trusted partner with HR, Recruiting, Diversity & Inclusion, Internal Communications, Corporate Affairs, Marketing and business leaders, and more. Will promote the value of working for our company to help attract great candidates who fit our culture and who can support our mission. Working alongside the Talent Acquisition and Marketing teams, he/she will create and facilitate North America Recruitment with marketing content. This role will have continuous interaction with and support the site HR teams and Regional Talent Acquisition Managers. The position will assist in creating an overarching recruitment marketing strategy for NA and by market for our locations. They will assist in helping us carry out that strategy. This person should possess some design skills as well to include creation and design of print and digital content for recruitment marketing including web-based promotional materials. This position will assist in bringing our brand to life in the markets and communities we live and work through sharing our employee value proposition. Why policy? For a better world. Why Harris Public Policy? Because when it comes to better policymaking, evidence matters. The Recruitment Marketing Project Coordinator will be responsible for planning, managing and executing recruitment marketing projects as assigned by the Associate Director of Marketing, Recruitment. This role will split time between administrative duties and assist with the creation of marketing content and assets. Bachelor’s Degree required. Master’s Degree preferred. The Recruitment Marketing Assistant – Driver Hiring Center will be responsible for recruitment marketing and social media marketing to help Penske reach truck driver candidates and share our career opportunities. You will help to promote brand awareness and share our story. This is a fun and creative position that supports our driver staffing needs with innovative solutions. In this hourly role, you will primarily support processes around social media, recruitment collateral, and media monitoring. This role will oversee all driver opening advertising needs – online, in print, and on social. It will report to the Manager – Employment Brand and Social Media and will be based in our corporate offices in Reading, PA.
We are currently seeking an experienced Global Talent Marketing Specialist, who will collaborate with the Employer Brand Team and other functions to drive high-touch and feel activities that attract diverse candidates globally who fit with our talent needs and our unique company culture. Although this is a global role, we strongly prefer that this individual work in Newark, Delaware, where Gore has its company headquarters. The Johns Manville Talent Acquisition team is exciting opportunity for an Employment Brand and Talent Attraction Manager for our talent acquisition team. The Employment Brand and Talent Attraction Manager will oversee the entire creative process for the talent attraction and recruiting process across JM for both external and internal candidates. This role is critical to the future success of recruiting at JM as well as brand awareness, hiring, retention and more. As the Employment Brand and Talent Attraction Manager you are passionate about finding ways to attract and delight perspective candidates at every stage of the hiring process, you are a creative thinker, you are inquisitive by nature, you love working with people, you have the ability to influence others through storytelling, you are a team player with the confidence to take the lead and guide others, and you enjoy using your project management skills to see projects through completion. The Marketing Consultant is a client-facing role that will provide marketing consulting directly to our customers, helping them design and execute recruitment marketing plans. Your work will include all aspects of modern digital marketing: strategy development, brand, persona, and value proposition development; visual design and content creation; and will be executed across multiple channels; social, email and paid media programs. The Recruitment Marketing Lead will collaborate with members of the Recruitment Operations team to attract high quality, diverse candidates to our roles globally. If you are an "out of the box" creative thinker and natural storyteller, we have the great tools to allow you to develop new and groundbreaking web and social content that will be shared and viewed globally. This person must also live and breathe data with the ability to derive practical insights. Are you driven to make a difference with each and every one of the more than 300,000 employees in our company, globally? Have we got the opportunity for you. Here you’ll thrive with an innovative spirit, love of technology and an eye on the user experience. 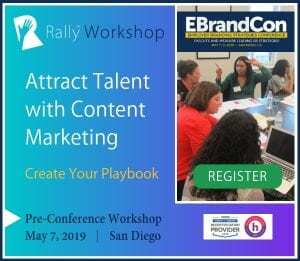 Utilize your deep knowledge of marketing, content management, social media, virtual events and interactive strategies in order to educate, engage and guide on talent acquisition and team strategies and career exploration. You will combine creativity, technical and analytical thinking in order to deliver an engaging and effective interactive marketing experience that connects with our internal partners and employees. Each and every one. Are you game?